In this tutorial, we will look at how to import transactions from different sources into ShareScope. 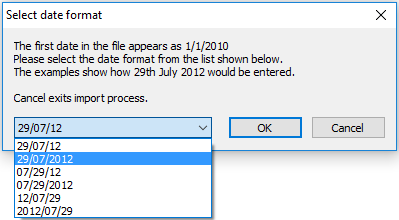 Date - The format can be selected during the import process - see below. Time - Optional - will be used if present. Exchange - Optional - ShareScope assumes the share is listed on the LSE. If the share is listed on a different exchange or is a different type of instrument then you will need to use an exchange code column - see below. Ticker - Also known as EPIC or TIDM. This is the exchange code for the share and is the primary identifier for the share. Price - This is the price per share paid or received and is in the lower denomination of the currency i.e. pence/cents. Total - This is used for Credits and Debits which will be recorded in an optional Cash Account that can be created upon import. Note - This records a note against the individual transaction and is optional. To locate the full list of exchange codes used in ShareScope, click on Help in the menu bar, choose Help - contents and search. Select the	Index tab. Type: "Exchange codes"
Here is a selection of the more popular codes that are used in ShareScope. If the transactions that are to be imported are not recorded in GBP then a row will need to be inserted at the top of the file to indicate the currency of the portfolio. The import function looks for the currency code in the first row so you can write "Currency: USD" or "In EUR" or just "USD" as examples. This is how the transactions would look in Excel prior to saving in the correct format. When you save the file you will need to make sure you save it with the correct file type. 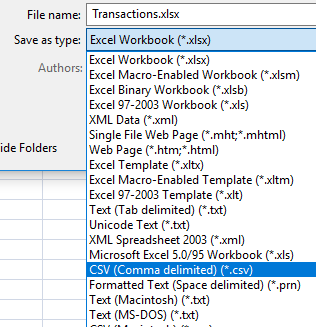 To save the file as the correct type select the Save As option in Excel and then select the Save as type: drop down list and select the CSV (Comma delimited) (*.csv) option. This process should be the same in any other spreadsheet software you may be using. Select the file containing your transactions and click on	Open. ShareScope will scan the file and query any columns that it does not recognise. You can either choose to 'Ignore this column' or identify it from the drop down list. 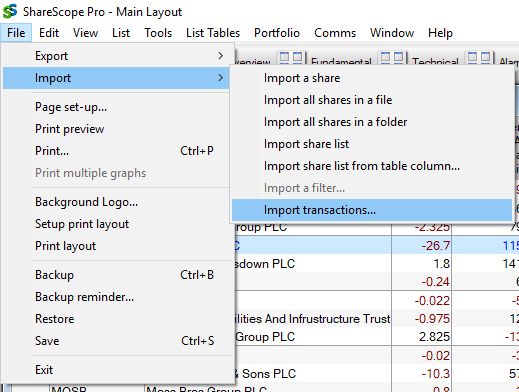 In this example a file containing transactions has been exported from SharePad and is being imported into ShareScope. SharePad has a unique id for shares called IONICID as this cannot be recognised by ShareScope it can be ignored. 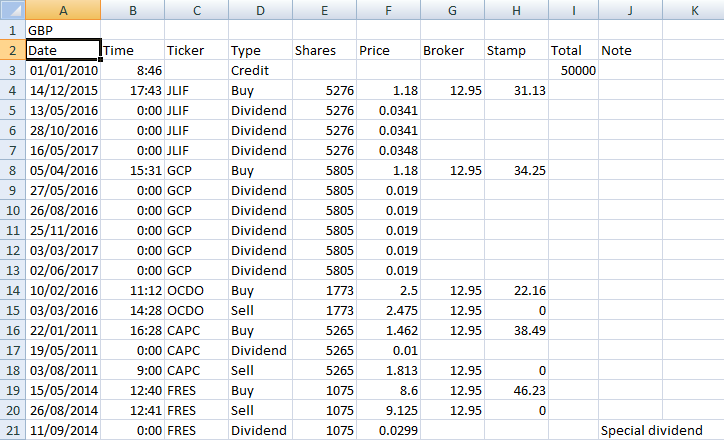 Once you have dealt with any unknown columns ShareScope will prompt you to	Choose a name for the portfolio. Enter a name for your new portfolio. Note: If the name of the imported portfolio has already been used, you will have to enter a different name to proceed. Two portfolios cannot have the same name in ShareScope. The option to create a new cash account is also available if you have Credits and/or Debits in your transaction file then you should tick this option. You will then be prompted to specify the date format you have used in transaction file. If the import function identifies any unknown transaction type it will ask you to confirm a type for the transaction in question. Click on OK and a notepad will open with a list of the shares that were not found during the import process. The portfolio and, if you chose to create one, the cash account will have been created and you will be able to select them using	Select a portfolio.